What is the highest antioxidant tea? What is the healthiest tea? There are only a few dozen caffeinated versions, since all those are made from the same leaf – that of the Camellia sinensis. Whether it’s white tea, black tea, oolong or matcha, all which contain caffeine come from that plant. 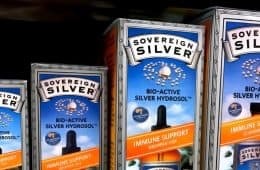 When you include the herbal varieties consumed throughout the world, you can actually come up with a list of over one thousand distinctly different kinds to drink. It’s hard to pit the different types of tea and their benefits against one another. Naming the number one is largely subjective, since what’s most important to one person may differ from another. 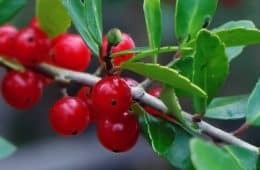 So rather than try to answer what is the healthiest tea in the world, let’s first home in on the highest antioxidant tea. That’s something you can objectively answer, based on ORAC testing. 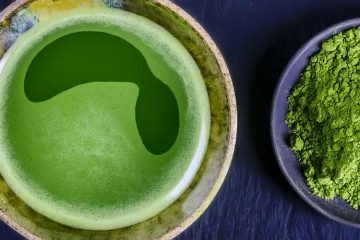 From threads on Reddit to articles on Fox News, you will come across seemingly authoritative sources who claim that matcha green tea is the best for antioxidants. 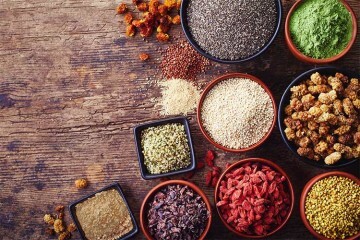 Much of the confusion comes from mixing up the ORAC values for dry powder versus the brewed tea. One is obviously much more concentrated than the other. An ORAC value typically uses a 100g weight of the food for measurement. 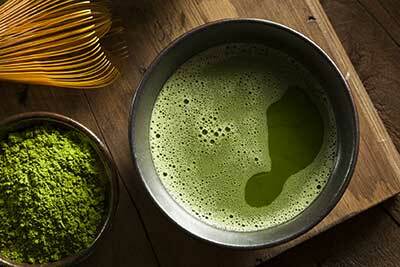 There should only be 3.15g of matcha powder in a brewed cup of that weight (which is technically 1.75 servings). That’s according to the traditional Japanese way of how to make matcha, using 1.8g of powder per 2 fluid oz serving. The other 96.85g is water and that contributes zero antioxidant activity. 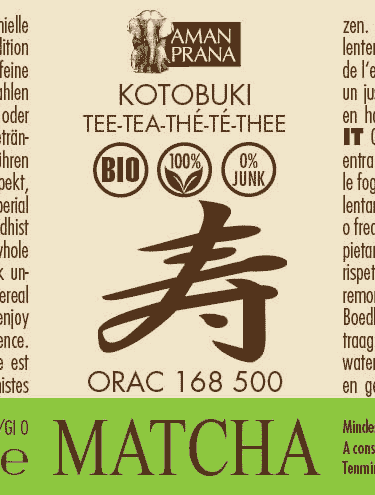 Some sources will report the ORAC value for 100g of pure dry matcha powder. Then like a game of telephone, someone reads that and mixes it up as being for 100g of brewed tea. The difference between those two values can be up to 50-fold. Sorry Fox News… that’s fake news. When brewed, regular green tea has an ORAC value of 1,253. Matcha, which is a Japanese version of green tea made using the young leaves and involves partially-shaded growing techniques, is higher but not exponentially; an ORAC of up to around 3,000. That’s about double the antioxidants of regular green tea, not 10x or 100x like some people claim. To even get to that doubling, you need to be using one of the highest quality ceremonial grades of matcha available. 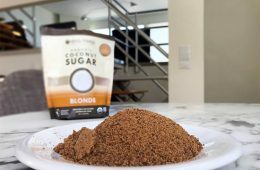 For example, the brand pictured has an ORAC of 168,500 for 100g of the pure dry powder, before heavily diluting it to make brewed tea. According to ORAC measurements, the tea that has the most antioxidants is flor de Jamaica, which is the Spanish name for hibiscus tea. When brewed, its ORAC value is 6,990. That’s over 100% higher than the best quality matcha. 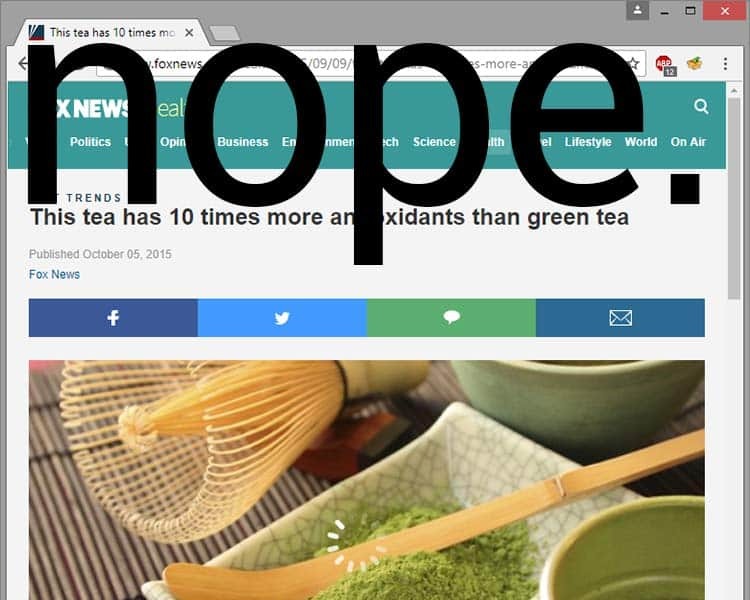 It’s at least 400% higher than green, black, and white teas. Made from the dried petals of hibiscus flowers, this beverage is loaded with anthocyanins. 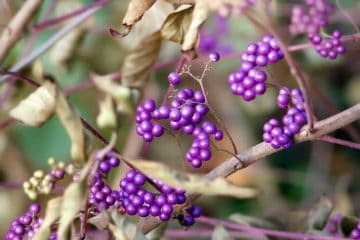 Those are pigments that give many plants their reds, purples, and blues. 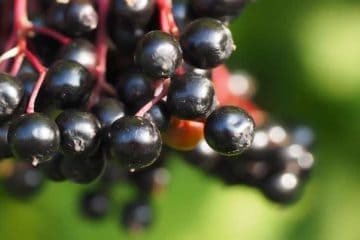 Aside from color, they add potent antioxidant activity. Also contributing is quercetin. 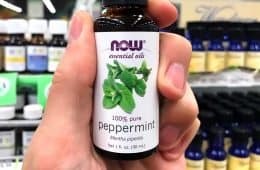 There is ample evidence that this antioxidant may be anti-inflammatory, exert positive effects on blood pressure, and offer anti-aging benefits by mimicking some of the biological effects seen in a calorie-restricted diet. Hibiscus is the tea with the most antioxidants. 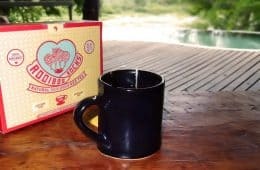 Other reasons why it’s considered to be the healthiest tea to drink includes research suggesting it may help blood pressure, cholesterol, weight loss, and exhibit anti-cancer activity. This research is preliminary and therefore the effects are not considered proven in humans, yet what has been published so far is encouraging. Effects on cancer cells have never been tested in humans and therefore remain unproven. 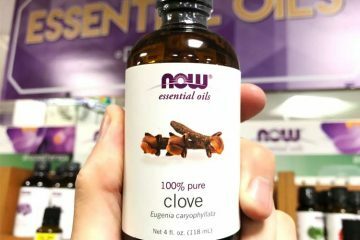 However using cultured human cells in laboratory settings, as well as animal models, it has been observed that the growth of certain cancer cells seem to be inhibited by some degree when they are exposed to compounds derived from the plant. The above chart was from a study using immunodeficient mice. These are rodents with a genetic mutation that are able to grow implanted human tumors, without their bodies rejecting those human cells. 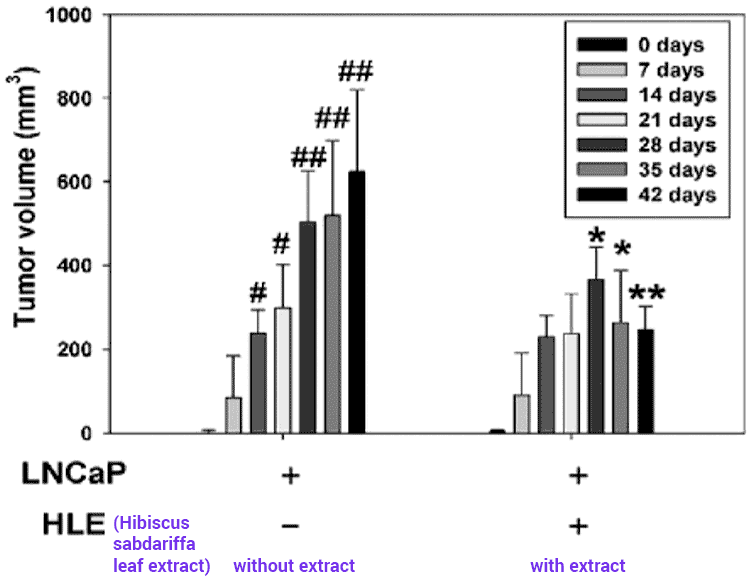 When prostate cancer was grown on them over a 42 day period, you can see how the tumor volumes were lower in the mice getting the hibiscus leaf extract, compared to those who weren’t. With zero calories per serving, hibiscus is always a healthy tea for weight loss. For more details on the studies, check out the hibiscus tea benefits research that has been done to date. 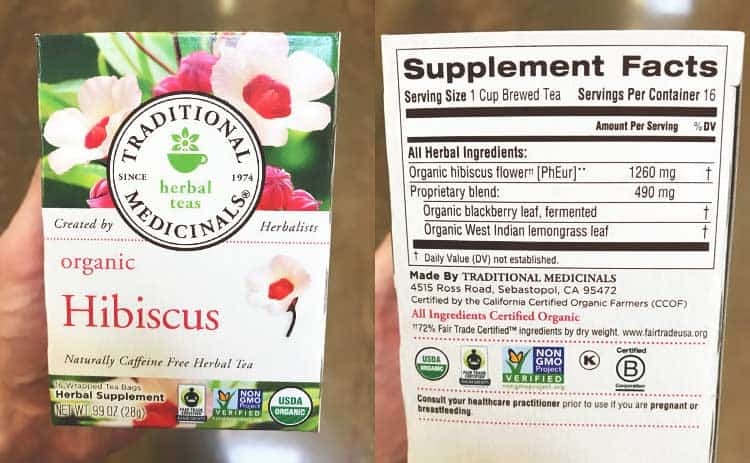 To be clear, the potential health benefits of hibiscus tea remain unproven. There is not enough human research for any of them to be classified as proven. 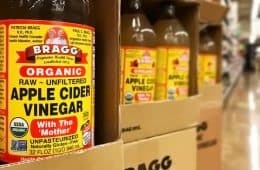 For that reason, you should NOT drink it with the intention to prevent, cure, or treat any disease. It’s not a medicine. 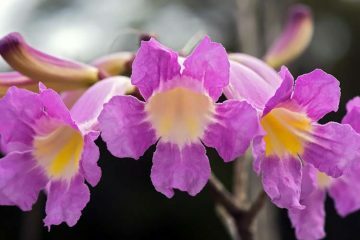 It should be consumed as a food or dietary supplement only. As far as it possibly being bad for you, there isn’t proof of that, or even research hinting that it might be unhealthy. It’s zero calories and tastes delicious if you sweeten it with this zero calorie monk fruit. With that added, it kind of tastes like Kool-Aid and we say that as a compliment, not a criticism! Because unlike that disastrous drink you had as a child, this is something guilt-free and good for you. Sip on it in the morning, afternoon, and into the evening, too. It’s a 100% caffeine-free herbal tea. Served as a cold tea, agua de flor de Jamaica is popular in Mexico, Central, and South America. In Australia they called it rosella. In the United States, Canada, and United Kingdom, unfortunately it’s a very hard to find beverage. Practically no one sells if pre-brewed. You won’t find this healthy tea at Starbucks. Even the tea bags are hard to get your hands on. You probably won’t see them at Walmart, Target, or a traditional grocery store. At least we never have here in Los Angeles. Even if we did see it for sale, we probably wouldn’t buy it. 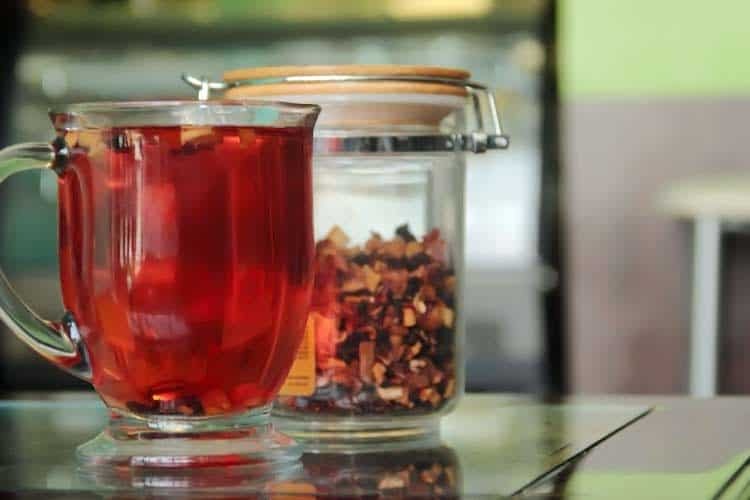 The healthiest tea to drink in the morning is a combination of hibiscus and rose hips. Just as resveratrol is believed to activate the AMPK pathway, so are rose hips. Although not proven in humans, research suggests that AMPK activators may exert certain anti-aging benefits related to longevity, muscle mass, brain health, and more. 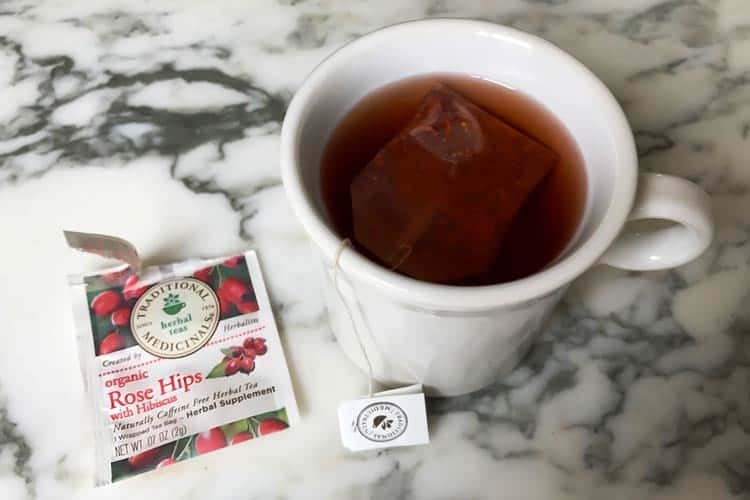 Here at Superfoodly, we go on Amazon and buy this bulk 6-pack of rose hips and hibiscus tea. At least one cup is brewed daily using two bags, usually mid-morning. That’s long after drinking some low acrylamide coffee or mushroom coffee upon waking. Is it the healthiest tea? As mentioned at the start, that’s a loaded question since the answer is subjective. Though given the high antioxidant activity detected in hibiscus flowers, as well as the delicious taste when sweetened with this liquid monk fruit, it’s hard to not like this one the best! Chaga tea blows all of these away by factor of 10 for ORAC score. Because the specific compounds are different for each type of tea, the best answer is often to vary up the types, rather than relying on one single tea. Yeah, this was published 6 months ago and you’re claiming that Hibiscus is hard to come by… I can’t tell you how many teas I’ve had that have contained hibiscus! Adagio Teas herbal constantly have Hibiscus… as well as Zhena’s Gypsy tea, and Stash Teas also have hibiscus in some of their teas. So I don’t know what brands you’re drinking, but you’re not as informed as I am. Even in bagged tea I’ve found it. Even in the stores I’ve found Hibiscus and it’s not by Traditional Medicinals brand. Though, I’m sure you’ll shot down my comment because the Hibiscus doesn’t come alone in any of these brands, except for, off the top of my head, Zhena’s. Because, I myself, have Chaga. Sorry, it’s fake reporting to claim that Macha is elsewhere fakely claimed to have the most antioxidants unless those elsewheres say they are including herbal tea in their claim as you are in slamming them. The author calls bull on exaggerations, but then does just as bad. I would try the rose hip and hibiscus tea, if not for the price being ridiculous. Which is just as well since I have yet to find a herbal tea that doesn’t taste awful. Green tea is awful too. Thankfully, black tea, black, is just right. Black coffee is good but I drink tea. Nothing added. People add so much to these hot drinks, they could start with most anything and be satisfied. I’ve had many versions of black tea, including the premium brands, which are often good. But easily, the best tasting tea I’ve found may be also the least expensive one, by far. I would love to find a tea without caffeine that I like, but it may not exist. Antioxidants don’t even make the discussion. I have to followup what I wrote because I just tried a hibiscus tea blend and it’s the first herbal tea I’ve lked, let alone found drinkable.. It has other ingredients but hibiscus flavor probably dominates. Therefore, I need to try pure hibiscus and the recommended hibiscus + rose hips sometime too. The tea I bought is Lipton, although Lipton for no good reason. Regular Lipton tea is drinkable but I would choose any plain black tea over it. The Lipton Berry Hibiscus is powerfully fruity and tart, and could be compared to kool-aid. So I should absolutely hate it. But I don’t. It works. It’s a burst of flavor, so I want no more than one cup of it in day, which is a good thing. A couple cups of plain black tea provides all the caffeine I want from tea, so I wanted something else. I’m impressed that after finishing a cup of the Lipton hibiscus tea, there’s no after effect or after taste. 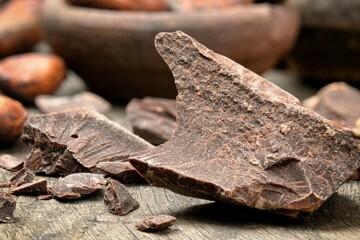 This is a problem with cacao and provided incentive to drop coffee for tea. 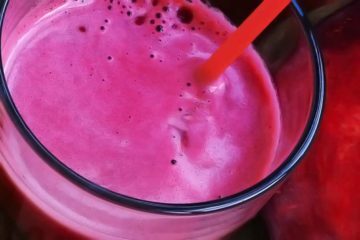 It’s ingredients are Hibiscus Flowers, Maltodextrin (Corn, Tapioca), Chamomile Flowers, Citric Acid (Provides Tartness), Spice, Licorice Root, Roasted Chicory Root, Natural Flavor, Soy Lecithin, Pomegranate Juice Solids, Blueberry Juice Solids, Concentrated Goji Juice Solids. Just before I tried the Lipton tea, I discovered and tried Trader Joe’s DRIED SWEETENED Hibicusus Flowers ($2). I do not know if this is a new product. 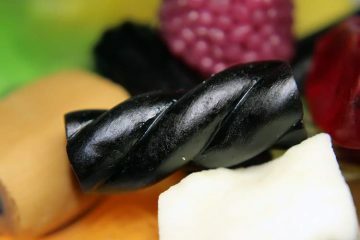 Again, a powerful fruity sweet treat. I’m not big on dried fruit but this is as good as any dried fruit. Very good when that’s what you want. I wish I could compare it without the added sugar. Trader Joes has their own hibiscus tea, and it has rose hips too. I may try it sometime. INGREDIENTS: HIBISCUS, ROSEHIPS, LEMONGRASS, PEPPERMINT, ORANGE PEEL, LEMON VERBENA, NATURAL FLAVORS, WILD CHERRY BARK. Hopefully, I do not tire of the hibiscus taste, although I’m still not certain I know exactly what it is. A big plus is that hibiscus flowers are easily grown, so the price should go down and availability up – should it become popular. 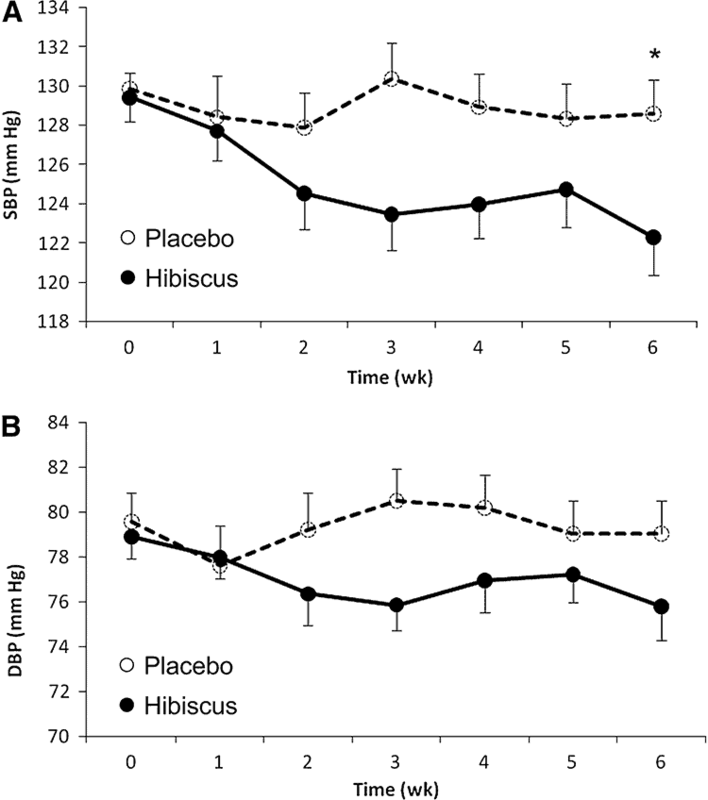 Does hibiscus tea cause insulin secretion? If so, isn’t it bad actually, I mean can it enhance insulin resistance ? I go to two Mexican grocery stores near where I live in Florida, and both carry flor de jamaica (hibiscus flowers) in bulk. One place sells it for $5.99 a lb, the other has it in plastic bags (last bag cost me $3.30, don’t know the pound weight, but not expensive. I take a big stockpot and put in the flor de jamaica (about half the $3.30 bag), about 6-12 herbal teabags usually from celestial seasonings, mostly chamomile and peppermint, a few oolong teabags and whatever else is available: cinnamon sticks, fresh ginger, sliced cucumbers, lemon or other citrus. Simmer it a little while then let the hibiscus and the other ingredients sink to the bottom. Pour it off with a strainer and end up with about two and a half gallons of hibiscus tea, which goes into the refrigerator. Drink it daily, lasts me up to two weeks.